Any yarn that with a soft drape. I used 15gms sportweight homespun rainbow dyed merino for the smallest size. 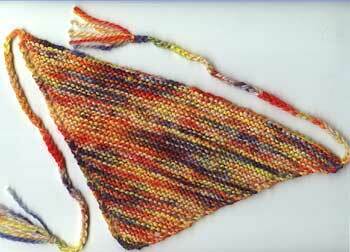 It is very important the the knitted fabric drapes well, otherwise the kerchief will stick up and look silly. Needles to suit your chosen yarn. I used 4mm. Continue until work measures 12 (14, 16)inches across. Cast off. Crochet a 9 inch chain at both ends of the cast off row. Using 3 strands of yarn make small tassels at the end of each tie. Darn in loose ends on the wrong side. This pattern and photo are Copyright © Sarah Bradberry July 10th 2000. All rights reserved.